So how do you get started on putting in a bookings system? You can draw up a shortlist of potential systems and then evaluate them all. This will work but is very time consuming. It also requires you to learn each system in order to evaluate it which can be very tiresome. We encourage you to just phone up and tell us what you are after. Our number is at the top of every screen. Within a few minutes we will be able to tell you if our system can help or not. 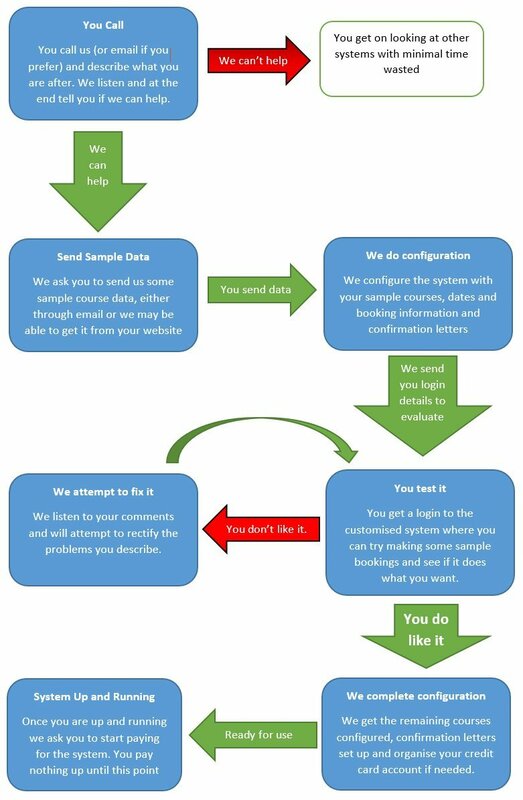 If we can, we take you through a simple process where you supply us with some sample data and we do all the configuration. We then give you access to the test system for you to evaluate and tell us if it's what you wanted. The diagram below illustrates the process. All customers get a free month trial of the system whilst we work with them to get it how they want. During that time we try to really understand what you are trying to achieve so we can get the account working exactly how you want. If we cannot achieve this then you owe us nothing. Hopefully you will be very pleased with what we can do and only at that point do we ask for the monthly payments to start. The diagram below summarises how we get you up and running. We use the phone a lot, we love it. Give us a call now if you like, the number is at the top of the screen. Email is great, but when you're trying to work out what system can do the job you require there can be a lot of back and forth exchanges in email that lead to a muddled view. We encourage customers to just call us and tell us what they are after. This does not stop when you become a customer, technical support is included and is done through the phone too. You are welcome to email if you prefer but sometimes the phone is easier when trying to diagnose a problem.